The Ram commercial lineup boasts the versatility, strength, and capabilities that you need to get the job done and keep your business running smoothly! Two heavy-duty trucks stand out from the lineup, the 2019 Ram 2500 and the Ram 3500. These trucks deliver best-in-class towing and payload capacities as well as a comfortable ride that will please every member of the crew. These dependable powerhouses make it possible to haul everything you need from cargo to supplies to the job site. You can learn more about these models by reading the rest of our review! The 2500 and 3500 are available in a total of six trim levels (one of which is a 2500 exclusive) and each one is crafted with their own theme. The six trim levels include the Tradesman, Bighorn, Power Wagon -- the 2500 exclusive model, Laramie, Laramie Longhorn Edition, and Limited. Both trucks are outfitted with a reimagined center console that boasts 12 storage configurations with optional features like a wireless charging dock, assignable/dedicated switches, and up to five USB ports! Every trim level is also outfitted with a redesigned rotary e-shifter dial and push-button start. The shifter area now also includes axle transfer and lock case controls (when equipped), Hill Descent Control buttons and more! There are also five USB ports, allowing everyone to keep all their devices fully charged throughout the ride! Could you tell me about the engine power? 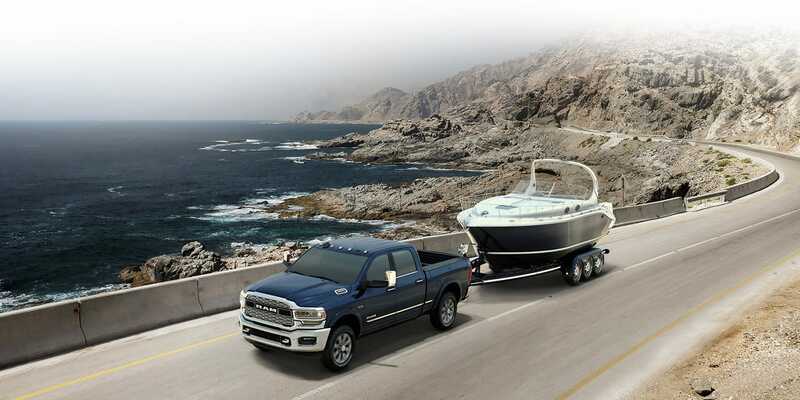 When it comes to engine power, the 2019 Ram 2500 and 3500 models get the job done! The standard engine for the lineup is a 6.4L Hemi V8 that generates the best-in-class 410 hp and 429 lb-ft of torque. More power can be found with the Cummins Turbo Diesel engine that produces up to 370 hp and 850 lb-ft of torque. The most powerful engine is available for the 3500. This Cummins 6.7L I-6 kicks out up to 400 hp and best-in-class 1,000 lb-ft of torque. The 2500 delivers the best-in-class diesel towing, maxing out at 19,780-pounds and a max payload of 4,050-pounds. The 3500 offers a best-in-class 35,100-pound towing capacity and a best-in-class 7,680 gas payload! These trucks are powerful and capable, ready to help you get the job done! Does the Ram Heavy-Duty models come outfitted with safety features? There are more than 100 safety features available for the 2500 and 3500 models in the 2019 model year. All models come equipped with exclusive active safety features like Automatic Emergency Braking or AEB, AEB with trailer brakes, Forward Collision Warning, and Adaptive Cruise Control. A 360-degree camera display is also available! This feature is perfect for navigating the job site, parking spots, and loading docks with optimum precision. A tire pressure monitoring system is also standard, monitoring up to six tires of the truck itself. In the 2019 model year, the tire pressure monitoring system adds trailer tire pressure monitoring for up to 12 tires. A rearview camera is standard as well and in the 2019 model year an available second-rear view camera is made optional to monitor the payload in the bed of the truck! The 2019 Ram 2500 and 3500 trucks are beasts both on and off the work site, ready to take your business to the next level! Packed with versatility, both the Ram 2500 and 3500 are capable of heavy towing and payload jobs as well as family adventures. If you are interested in learning more about these trucks and what they have to offer in the 2019 model year reach out to our sales team today. You can reach them over the phone or in person at the dealership anytime we're open!